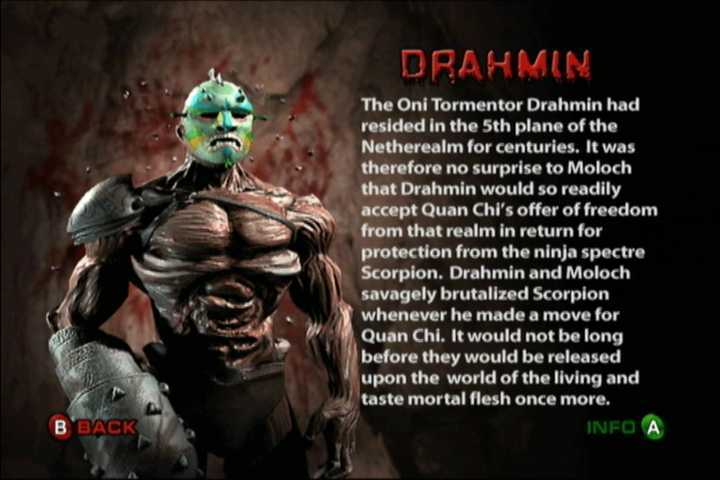 Drahmin made his debut in Mortal Kombat: Deadly Alliance as one of two Oni, demons of the 5th plane of the Netherealm. He wields an iron club mounted on his right arm. 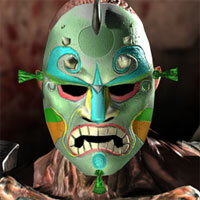 The mask he wears is an artifact called the Face of Kun-Lo. Wearing it allows him to control his rage and fight with his disciplined Netherealm style. Removing it causes him to go into Oni style where he loses his focus and attacks with murderous insanity. Drahmin was not always a demon. 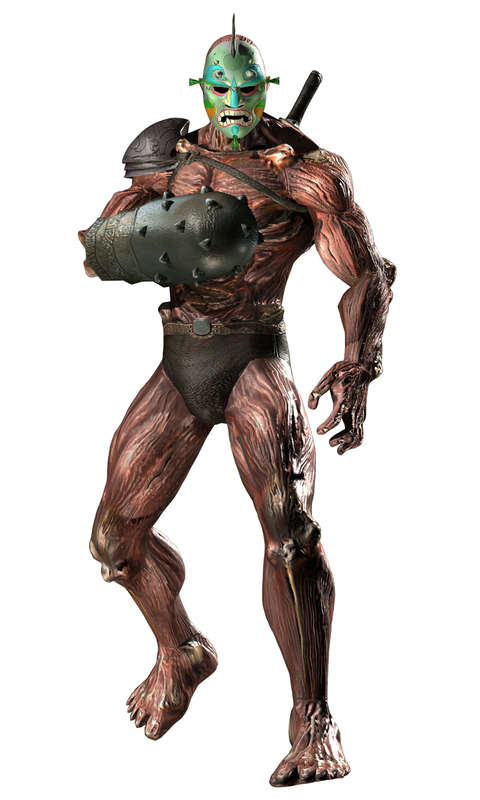 Centuries ago, he was a cruel human warlord in Outworld. For his crimes, he was exiled to the Netherealm where his body and soul were to be tortured for all eternity. As the years dragged on, he fell further and further into insanity until his humanity was lost altogether. He eventually accepted his fate and submitted to the power of the Netherealm. He re-emerged from the Netherrealm depths as Drahmin: the Oni Tormentor. The two Oni known as Moloch and Drahmin are allies. They roamed the 5th plane of the Netherealm in search of damned souls to torment. After many centuries, the two demons came upon a battling Scorpion and Quan Chi. Quan Chi, sorely pressed by Scorpion, pleaded for aid from the Oni. Drahmin and Moloch intervened and drove off Scorpion. 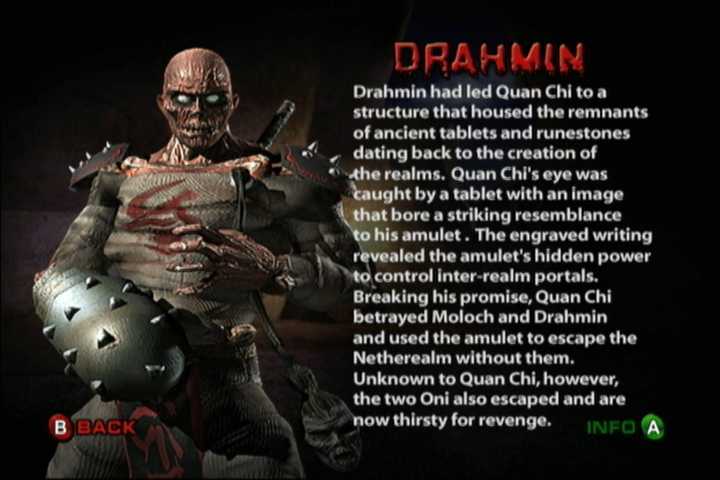 Demanding payment for their services, Quan Chi agreed to liberate them from Netherealm. The Oni agreed and led the sorcerer to an ancient structure rumored to be a gateway to other realms. Quan Chi studied the ruins and discovered that it was a dormant portal that could be used with Shinnok's amulet, now in his possession. Suddenly, Scorpion attacked again and Quan Chi took advantage of the distraction to activate the portal and escape from the Netherrealm. The portal had not yet closed before all four managed to pass through. The two Oni found themselves in Outworld with Scorpion and Quan Chi nowhere to be seen. Now free, Drahmin and Moloch began searching for Quan Chi. They scoured the wastelands and killed all they encountered. Before their encounter with Shang Tsung, they encountered the cyborg Cyrax and Li Mei. Both escaped the Oni's clutches. Shang Tsung found the pair after he and Quan Chi had formed the Deadly Alliance. He employed them as a safeguard measure against any treachery from his partner. 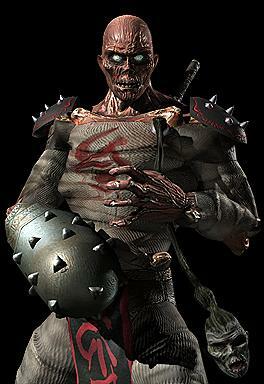 He kept the Oni hidden beneath his palace and paid the Oni with both mortals to feed upon and the promise of revenge against Quan Chi. While waiting for their opportunity, the Oni once again encountered Scorpion. This time, the demons overcame the ninja spectre. Knowing that they themselves were unable to devour the spectre, they instead disposed of him by throwing him into the Soulnado. Umm... I'm just going to be blunt here. What crappy, ugly, stupid design. Is this a War Gods character? lol. Drahmin = Rotting Flesh + flies + a club + Tiki Mask? Who would even want to use such an ugly character? (Nobody, that's why they never brought him back). What I really don't understand about this series of MK games, is why the Midway dev-team decided to create such "different" designs from those that made the MK series so popular in the beginning. 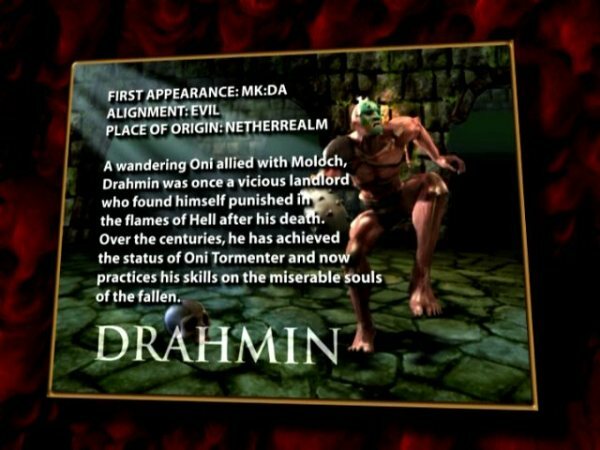 In other words, if Drahmin was in the original Mortal Kombat, I don't think so many people would have gotten into it as much. Who ever came up with this design was probably fired a long time ago. lol. I'm pretty sure even Ed Boon acknowledged that Drahmin is a terrible MK character (if only he would've thought that before MK: DA came out).